A long planned trip to the SW this Friday and Saturday for johnstna and I saw us change plans a number of times. 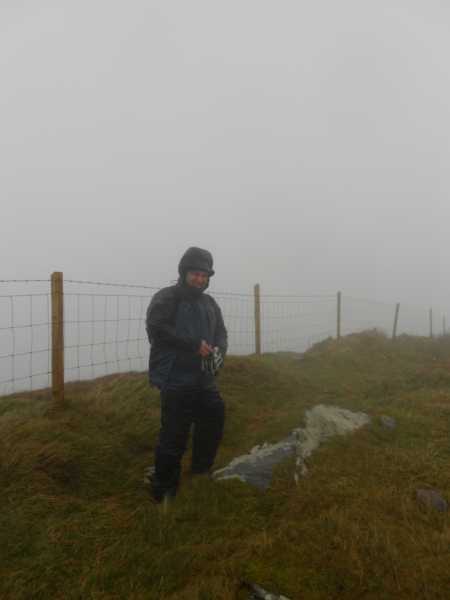 Plan A for Saturday was the southern half of the Glenbeigh Horseshoe. Looking at windguru a week out, it was clear that this was going to be a big ask - 59 knots forecast - that's 110 km/hr!! So plan B was hatched, a route over Eagle Hill and Mullaghbeg. Having just been almost blown off Cnoc an Bhraca, we mulled over this on Friday night in Cahirciveen and decided on a Plan C. Basically this involved identifying a hill, any hill, in the area, we could get up and down safely - in fact we got three low ones in the end, Bentee was the first.